Have you ever had a head injury? Perhaps you have bumped heads with someone and developed a knot on your forehead. Maybe you have tripped over a curb, hit your head on the pavement, and suffered a concussion (brain injury). I once saw a boy run full-speed into a large tree, accidentally striking it with his head. Talk about a painful experience! Though the human body is perfectly designed for God’s purposes in creating it, God did not create humans in the same way that He designed woodpeckers. If a human were to strike a tree with the force and regularity that a woodpecker knocks against it, he would soon die. Woodpeckers, however, keep on keeping on. Incredibly, woodpeckers can strike a hard surface 20 times per second and several thousand times a day without ever getting hurt. How forceful are woodpeckers’ strikes? According to researchers, they are “equivalent to 1,000 times the force of gravity,” or “more than 250 times the force to which an astronaut is subjected in a rocket during liftoff.” So powerful are woodpeckers’ strikes that some scientists believe that they close their eyes in between each peck—not to keep chips of wood from getting in their eyes—but to keep their eyeballs from popping out of their sockets as they strike the tree with such tremendous force. The woodpecker's beak is so strong it can remain perfectly straight and functional for more than 10 years and through more than 10 million pecks against a tree. It never has to be replaced or sharpened. 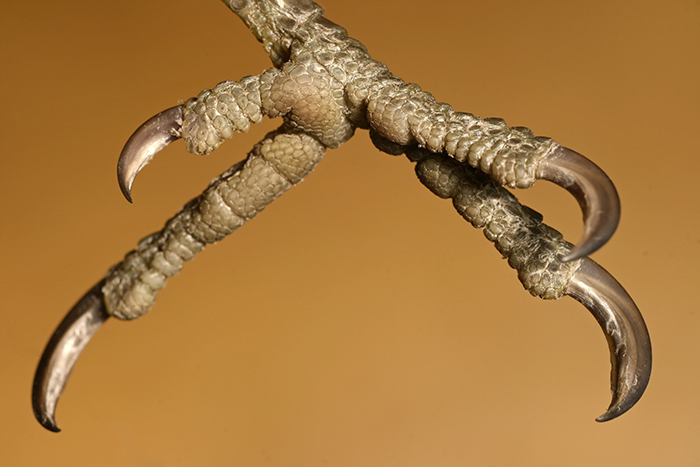 Unlike most birds, woodpeckers have two toes that point forward and two toes that point backward. This perfect design helps keep woodpeckers secure against trees as they drill their holes. How can woodpeckers survive such a head banging? How do their craniums not crack and brains not burst? First, woodpeckers have very strong, extra thick skulls, which can take a pounding without cracking. Second, and perhaps more important, woodpeckers have special shock absorbers that are better than anything man has ever made—better than the best car bumper, and better than any shock-absorbing football helmet. In the perfect place (right in-between the bird’s beak and skull), God created the perfect sponge-like tissue to absorb the perpetual pounding that this bird puts itself through on a daily basis. 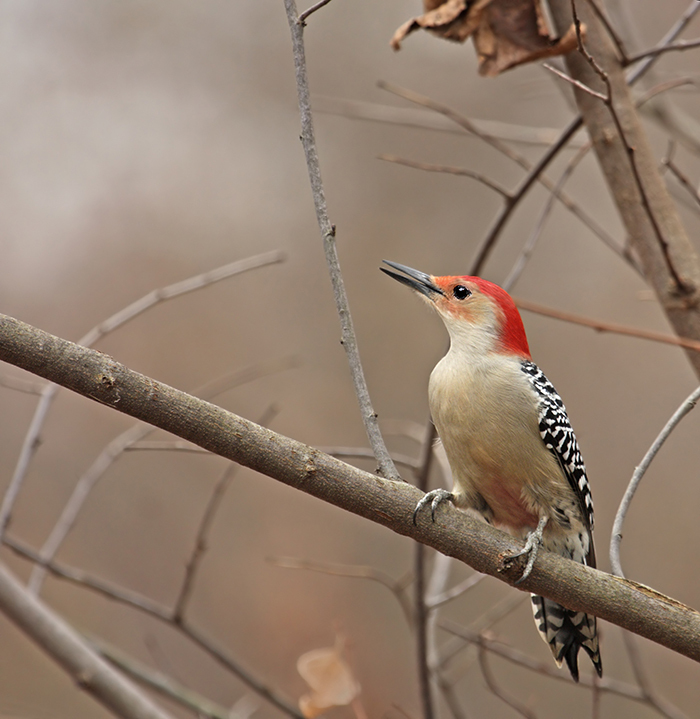 Once woodpeckers carve a hole into a tree, how do they get to the insects that may still be four or five inches away? If their tongues were short like most birds, much of the pecking woodpeckers do would be rather useless, because they would not be able to reach the insects. But God knew what woodpeckers needed. He gave them elongated tongues, which they can roll up and store deep in their skulls when not extended. 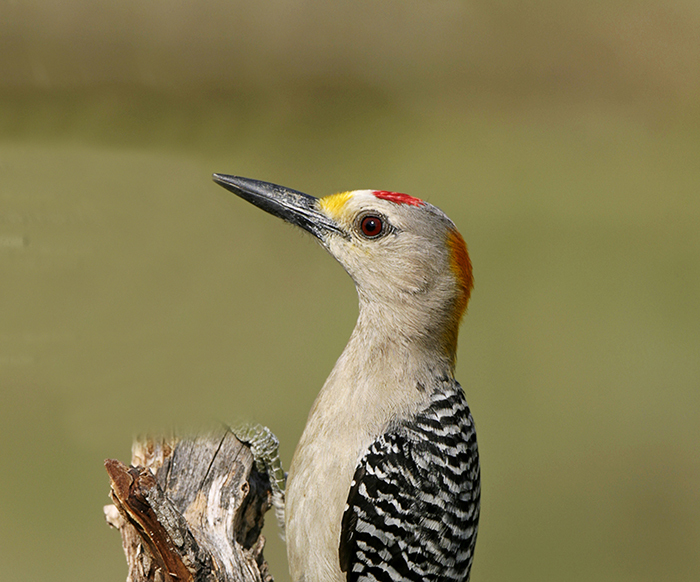 Some woodpeckers have tongues that are five inches long (or three times the length of their beaks). What’s more, their tongues are specially designed with rear-facing barbs and a sticky substance that help draw insects out of the tree and back to the woodpeckers. Why did woodpeckers ever start banging their beaks on trees for food when they could simply gather food on the ground like most other birds? How did the first woodpecker not kill itself the first time it began beating its beak against a tree? How did the first woodpecker know to close its eyes every time it struck a tree? When did the woodpecker get the special, shock-absorbing cushion between its beak and skull? If this special cushion took millions of years to evolve, what did woodpeckers do in the meantime? From where did woodpeckers get their sticky, barbed, elongated tongues that are perfectly designed for woodpeckers to stick into trees? 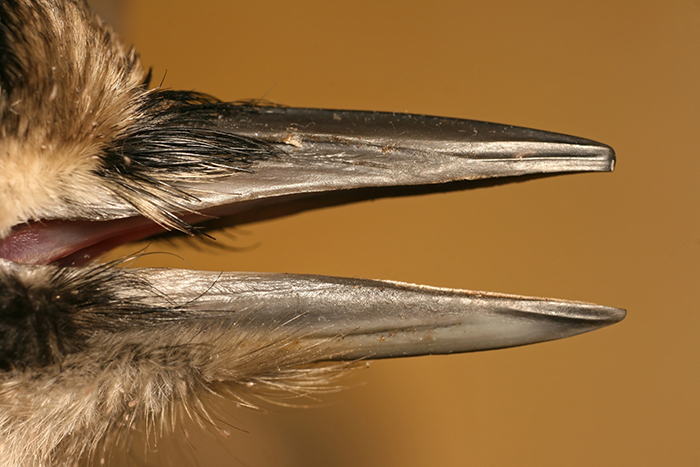 Why is the tongue of woodpeckers so different from ordinary birds? How did woodpeckers know that they could generate more force per peck if they had stiff tail feathers as well as two toes in the front and two toes in the back to anchor their positions to trees? Who taught woodpeckers that they could chisel trees in search of food? Who taught them to communicate with each other by banging their bills against trees? Who taught them to drill holes into trees for shelter? Why are other birds not evolving these amazing abilities, like the woodpecker supposedly did? The fact is, the idea that the wondrous woodpecker could evolve is absurd. This amazing bird did not have to knock itself silly for millions of years in hopes of one day getting everything it needed to do what it does. On day five of Creation (Genesis 1:20-23), Almighty God specially designed the woodpecker with a strong bill, a thick skull, a long tongue, and the best shock absorber in the world.